Last week Sony unveiled new 30" and 56" 4K OLED panels, slated for release in 2014, and they also updated their TRIMASTER EL professional OLED monitors with the new “A” Series which sport an improved OLED panel. Now I have some new information on Sony's new OLEDs. So first of all, that 56" panel is the same panel shown at CES, made in cooperation with AU Optronics. Sony do plan to use it for their professional video division, but it's still too early for any delivery dates or price information. The 30" panel is produced the same Japanese fab that produces Sony's current OLED panels (the 7.4", 16.5" and 24.5" panels used in Sony's professional monitors). This explains why the resolution of the 30" panel (4096x2160) is different than the 56" one (3840x2160) as the Oxide-TFT backplane of the 56" panel is made by AUO, not Sony. Both panels however use Sony's Super Top Emission technology. 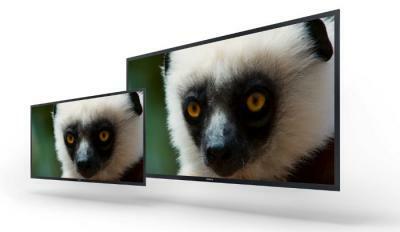 Our source at Sony confirms that they plan to launch the first 30" 4K OLED monitor next year - in fact they plan to do so by April 2014. Regarding those enhanced 16.5" and 24.5" OLEDs for the "A" Series monitors, our source says that the improvements were achieved by a new architecture - Sony redesigned the pixel construction and this enabled a major improvement in viewing angles and a greatly reduced color shift. Can you please ask your sony contact if they have solved this problem? Also it would be nice to get a ballpark price. I think it's too early to tell. Currently that 30" 4K is just a "panel", not a monitor product. We'll have to wait before Sony unveils the final product.